It might be one of the biggest news today as Apple has beaten Samsung to take the first place as number one smartphone manufacturer in the World. Apple has retaken this position after five years, and we can say that it is due to the company’s last year’s iPhones as well as due to one Samsung’s smartphone. Yes, we are talking about Note 7. There is no doubt that with Note 7, Samsung would have been the number one today. But due to whatever happened with it, Samsung lost a lot of revenue also, and this cost them the top position. 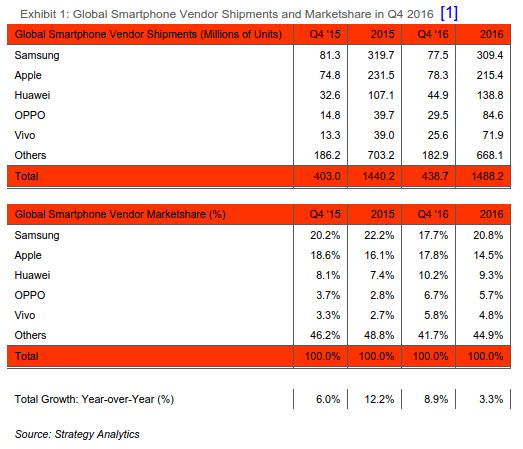 Global smartphone shipments grew an improved 9 percent annually from 403.0 million units in Q4 2015 to 438.7 million in Q4 2016. This quarter was the smartphone industry’s fastest growth rate for over a year. Smartphone growth is recovering slightly due to stronger demand in major developing markets like China and Africa. Global smartphone shipments grew 3 percent annually from 1.44 billion in full-year 2015 to a record 1.49 billion in 2016. APPLE IS NUMBER ONE SMARTPHONE MANUFACTURER BUT WHAT ABOUT OTHERS? Apple, as mentioned above, had the market share of 18% because the company shipped 78.3 million smartphones worldwide in Q4 2016 which is almost 5% increase if we compare the previous year. As per Samsung, the company is now 2nd regarding smartphone manufacturing and shipped 77.5 Million smartphones in Q4 2016. This resulted in a decrease of market share by 5%. But, if we consider the annual performance instead of Quarterly, the Samsung shipped 309 million units which is more than the number of smartphones shipped by Apple. So, in this case, Samsung maintained the first position. Huawei maintained its 3rd position with a global market share of 10% in Q4 2016. Well, Huawei has achieved the double figures for the very first time, and it seems the company is getting a good response outside China. The Fourth Position has been captured by Oppo that had 7% market share in Q4 2016 which is almost 4% more than last year. The company has made impressive progress, thanks to its R9 smartphone that sold like hot cake in China. On the Fifth position, we have Vivo which is still struggling for a solid place among smartphone manufacturers. Samsung will now try to get its place back with the Samsung Galaxy S8 and become the number one smartphone manufacturer again.Will Apple maintain its position as the number one smartphone manufacturer? Let’s see what is going to happen this year.